Whether you prefer a light ale, a British style bitter, IPA or a stout, Kennebunkport’s got craft beer lovers covered. The Kennebunkport Brewing Company (KBC) is a small brewery located under Federal Jacks pub in Lower Village. This “brew with a view” hand crafts their beers on the premises. Many are available for take-out in growlers and bottles from their KBC Coffee & Dry Goods store, also conveniently located under Federal Jacks. They are best know for their Shipyard beers which range from the Goat Island Light Ale to their Shipyard Blue Fin Stout. If you want to sample their full range, purchase their “Sampler” and try them all. Of course, you can also sit and have some nachos and a burger, look out over the river and enjoy their beers at Federal Jacks anytime of year. If you want to venture outside the Kennebunks, we love the Funky Bow Brewery & Beer Company in Lyman, Maine. It’s less than a 30 minute drive from the 1802 House Bed and Breakfast, and well worth the journey. This father son team have a brewery, a farm and a pizza company to deliver a really unique experience. They host Growler nights on Friday and Saturday nights at the farm featuring a selection of their Ales, live music and free pizza slices with dough handmade from the spent grain of the brewery and topped with their own organically grown veggies. 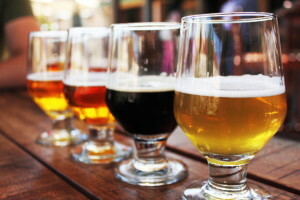 Or head over during the day and visit their tap room to sample their brews. In total, the state of Maine has nearly 60 craft breweries. Almost half of those are located in and around Portland, which is only a 30 minute drive from the Inn. These range from well known larger breweries to small artisan’s. Allagash Brewing Company offers their Belgian style beers in many restaurants and shops around Maine. They also do brewery tours and have a tasting room and retail shop on their premises. Peak Organic Brewing is a small Portland brewer handcrafting their ales using only the finest ingredients sourced from local farmers and artisan businesses. They were the first to introduce organic Maine grown hops in more than 20 years, partnering with local farmers. They can also be found in shops and restaurants around Kennebunkport. 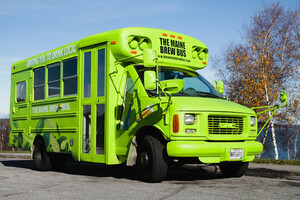 Because there’s so much to choose from in Portland, we think the best way to do the craft beer scene is through a guided tour with the Maine Brew Bus. They started up in 2012, and are now rated as the #1 Portland Activity on TripAdvisor. Their green buses are staffed with a non-drinking driver and a knowledgeable guide. The tours are all inclusive and provide a behind the scenes look into Maine’s award-winning breweries as well as some of the smaller newcomers to the market. Pub snacks, trivia and beer are all on offer. Tours range from $50 – $75 per person and book quick so make your reservation early! Plenty to eat and drink while you vacation in Maine. We look forward to sharing all the great experiences we have to offer when you next visit. See you soon!